Check Winn-Dixie ad sale, valid April 17 – April 23, 2019: $.98 lb Pork Spareribs; $3.98 lb Frozen Beef Oxtails; $4.98 lb Rancher’s Home Skirt Steaks; $.58 lb Roma Tomatoes; $.58 2 lb. 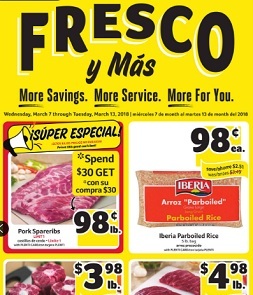 Bag Yellow Onions; 2/$.98 Iceberg Lettuce; $.98 Cafe La Rica; $3.98 Aviva Soda Crackers; $3.98 Xtra Liquid Laundry Detergent; $4.98 lb Whole Top Sirloin Tri Tip; $1.48 lb Bone-In Pork Shoulder Blade Steak or Country Style Rib Value Pack; $1.98 lb Boneless Country Style Pork Ribs; $3.58 lb Sanderson Farms Chicken Wing Value Pack; $1.78 lb Boneless Sirloin Thin Sliced Pork Chops; $3.98 lb Sanderson Farms Thin Cut Chicken Breast Cutlets or Tenders; $4.98 lb Fresh Ground Beef; $5.98 lb Rancher’s Home T-Bone Steak Value Pack; $4.98 Jimmy Dean Breakfast Sandwiches or Heat and Serve Breakfast Sausage; $7.48 Miami Beef Company 100% Pure Beef Patties; and more. Find all deals and offers in the latest Winn-Dixie Weekly Ad for your local store.